Be the first to share your favorite memory, photo or story of Marlene . This memorial page is dedicated for family, friends and future generations to celebrate the life of their loved one. 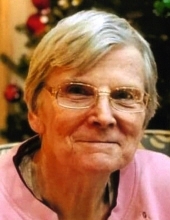 Marlene E. Marnell, 79, a native of the Stark area, passed away at 11:10 a.m, Saturday, January 26, 2019 at Oxford Grand Assisted Living in Wichita. She had moved to Wichita in 2016 from the Tampa, Florida area. She was born in Chanute on November 15, 1939, to Milford J. and Rachel M. (Tredway) Page. She grew up in the Stark area and graduated from Grant Township Rural High School. She also graduated from Chanute Junior College and a business college in Topeka. On May 29, 1959 she and Clarence W. “Bud” Marnell were married in Erie. They lived in various states and retired in Zephyrhills, Florida. She worked as a bookkeeper for various construction companies for many years. She enjoyed square dancing and belonged to camping groups. Surviving are three children, Pamela Stallard (Andy) of Wichita, Darrel Marnell (Dianna) of Covington, LA, and Bruce Marnell (Kim) of Seminole, FL; four grandchildren; two great-grandchildren; two brothers, Max Page (Janie) and Marion Page (Sharon) and a sister, Mavis Gard (John), all of the rural Erie area. She is preceded in death by her husband of over 50 years, Bud. Funeral services will be at 2 p.m., Saturday, at the Pierce-Carson-Wall Funeral Home in Erie, with Pastor Mark Demas officiating. Burial will be in Bethel Cemetery. Friends may call at the funeral home in Erie after 9 a.m., Saturday and the family will receive friends from 1 to 2 p.m. Saturday. Memorials are suggested to the Alzheimer’s Association. They may be left at or sent to the funeral home at Box 182, Erie, KS 66733. To send flowers or a remembrance gift to the family of Marlene E. Marnell, please visit our Tribute Store. "Email Address" would like to share the life celebration of Marlene E. Marnell. Click on the "link" to go to share a favorite memory or leave a condolence message for the family.